Product #21105 | SKU 037324 | 0.0 (no ratings yet) Thanks for your rating! The Rycote Softie Lyre Mount with MHR replaces the built-in or accessory mic mount on your camera. 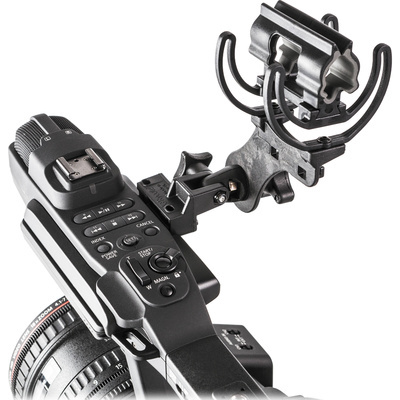 It includes three sets of metric screws as well, which allow it to be connected directly to most common camcorders, including the Panasonic DVX-series, Sony NXCAM, DSR, HVR, PMW and HDR-series, many Canon X-series models and more. The mount uses Rycote's patented Lyre technology and the durable W-shaped Lyre clips are made of hard-wearing and heat-resistant thermoplastic. Plus, the mic clip dramatically reduces the effects of unwanted noise caused by vibrations. The mount is particularly effective at reducing or eliminating lens motor and cable-borne noise. It can also be rotated and tilted freely on any axis, and may be stored in bags with a mic still fitted. The mount can be removed quickly as well.